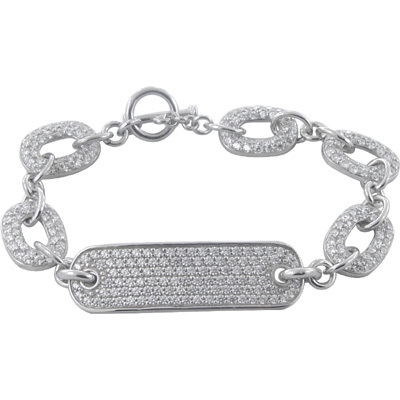 The Ziamond ID Pave Set Round Cubic Zirconia Toggle Bracelet is unlike any other toggle bracelet! The ID measures approximately a half an inch wide and slightly over an inch and a half in length. Each link measures measures approximately under a half an inch wide and slightly over a half an inch in length. 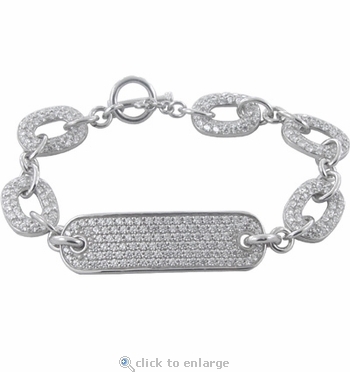 This is one of the nicest toggle bracelets you will ever see! Choose from 14k white gold or 14k yellow gold. This bracelet comes standard in a 7.5 inch length and a 8.5 inch length is offered as an upgrade, please see the pull down menu for options. For further assistance, please contact us directly at 1-866-942-6663 or visit us via live chat and speak with a knowledgeable representative.